The AVO®210 is a general purpose multimeter suitable for electricians, heating engineers and alarm technicians. The additional features make the instrument useful for a wide range of applications. 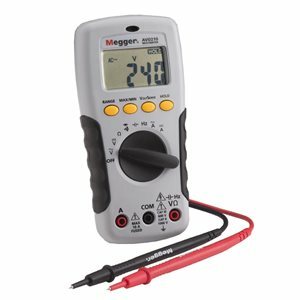 The instrument offers AC and DC voltage and current measurements as well as resistance, frequency and capacitance ranges. The AVO®210 has simplified functions that avoid continuous reference to the user guide. The test leads included with the AVO®210 have GS38 compliant shrouded tips.